Is known as one of the most widely distributed trees in the world. In North America it is found as a northern shrub beyond the tree limit in western Alaska, Greenland, and Iceland. It is found as far south as the western mountains of Washington, California, Oregon, and New Mexico. It is commonly found throughout the rest of the United States as well, New England states, Carolinas, Illinois, Indiana, Ohio, Minnesota, and Nebraska. Elevation: 4500 ft. – 11300ft. 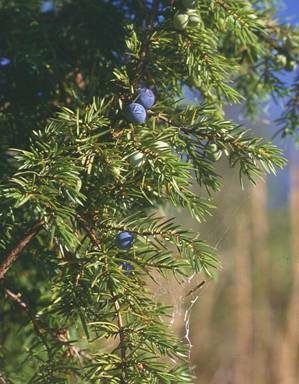 The higher elevations with colder temperatures are the most common areas Juniperus communis can be found. But can be found elsewhere in rare occasions. It can be found in lowland bogs, subalpine ridges, and alpine tundra. The habitat can vary greatly. It can include the following: dry areas, open areas, rocky areas, wooded hillsides, sand terraces, and exposed plateaus. It is shade intolerant, so is usually found in more open areas. It can establish highest abundance in very harsh environments, usually where competition is not present due to the stressful conditions. It has been said to be a seral species when spruces later in life replace it. It is also a colonizer in dunes in Michigan. Pinus ponderosa, Pseudotsuga menziesii, Pinus contorta, Pinus flexilis, Abies concolor, Picea engelmannii, Picea glauca, Populus tremuloides, Picea pungens, Pinus albicaulis, Abies lasiocarpa, Pinus aristata, Symphoricarpos albus, Ribes montigenum, Mahonia repens, Heterotheca villosa, Astragalus miser, Lupinus argenteus, Festuca thurberi, Carex geyeri, and Elymus elymoides. This plant is dioecious, which means the female and male plants are separate. Cones are only dispersed every 2 years. Dispersal of cones will occur in August thru October of the second season. The cones are berry-like and contain 1-3 seeds in every cone. Germination is very difficult with this plant, along with numerous seeds being defective (non-viable). Reports have shown up to 60% of seeds being defective (non-viable). Seeds have a semi-permeable seed coat and a dormant embryo. Germination includes breaking dormancy by a period of warm temperatures followed by a period of cold temperatures, all in all totally 7 months. Extreme temperatures, seed coat removal, or any other application has no effect on the breaking of dormancy. The highest germination rates come naturally via birds. Seed germination is difficult, but possible. Taking cuttings from female plants in suggested. A moist, compact soil with sufficient oxygen diffusion is the favorable media for seed germination. Bare root plantings. Seeds grown under nursery conditions are usually unsuccessful. Used in landscapes as ground cover, so numerous plantings is recommended. Keeping the soil moist is recommended. Once the plant in established, it will survive very harsh and stressful environments. Most commonly is a low growing shrub that may reach a height of 5 feet and a width of 13 feet. It rarely may grow into a tree-like form and mature to a 2-50 feet height. 5.) Pojar, Jim, Mackinnon, Andy. Plants of the Pacific Northwest Coast. Canada: Lone Pine, 1994. Data compiled by: Kevin Klein, 2 May 2003.